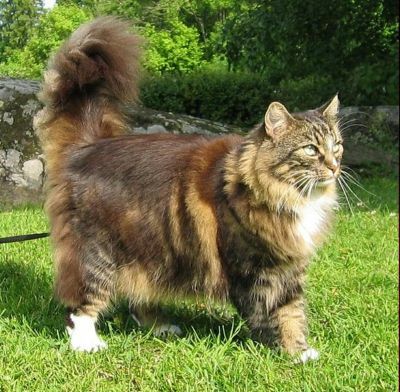 The Norwegian Forest Cat is said to have traveled with the Vikings on their ships and reference is made to this cat breed in Viking mythology and legend. Another name for the Norwegian Forest Cat is Skogkatt or Norsk Skogkatt and it’s strong body and thick fur is a perfect example of how an animal can adapt to climate and surroundings. At the start of the 20th century, this cat breed was becoming increasingly rare and was at risk of extinction. Breeding programs were started to ensure the future of the Norwegian Forest Cat, but WWII interrupted the progress. In the 1970’s the Norwegians again started a special breeding program and the late King Olaf designated it the official cat of Norway. In 1979 the first breeding pair was imported into the USA and TICA granted championship status to the Norwegian Forest Cat in 1984. The Norwegian Forest Cat is a large, muscular cat whose looks are deceiving – this cat is very agile and strong making it a natural hunter. The ears are large, wide at the base and arch forward on a head that is shaped like an equilateral triangle. The eyes are almond shaped and large, giving the cat an expressive look. The tail is long and flowing. The coat of the Norwegian Forest Cat comes in all colors and patterns. A dense undercoat developed to help keep the cat warm in the Scandinavian climate and the top coat is water resistant and semi-long. In summertime, the coat is shorter but still water resistant. 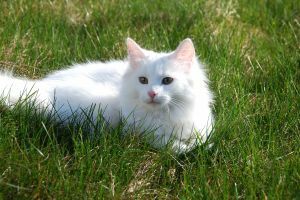 Even though this cat breed has such a dense coat, it does not require everyday grooming like other longhaired cat breeds. A brushing twice a week is sufficient to remove loose hair and to keep the coat in tip-top condition. 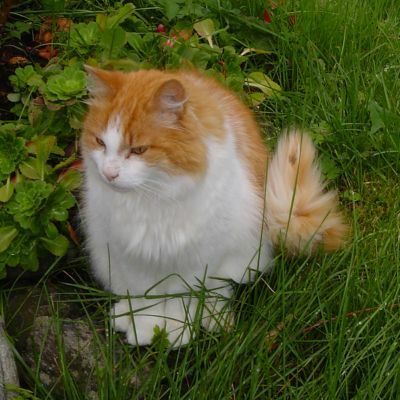 The Norwegian Forest Cat is highly intelligent and resourceful, and will adapt easily to its environment. It is a mild-mannered cat breed that is good with children and other pets. This cat breed enjoys interactive games as it gives it a chance to be close to its owner.